"Brainstorm" was originally developed to be the first film released in SHOWSCAN. Charlie Bludhorn who was chairman of Gulf and Western, who owned Paramount, wanted a film that would be partially normal, with sequences in SHOWSCAN. That was the plan. 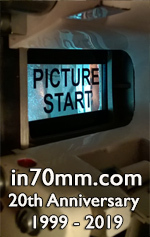 There would have been 70mm 60fps prints, with the 35mm stuff skip printed to 60 from 24. Also, there would have been 65mm material drop framed to 24fps for a normal 35mm release. There would have been no aspect ratio changes - only the frame rate. Nobody would go for it, as you know. So we settled on full aperture 2.2:1 65mm shooting of the (what would have been SHOWSCAN) vital POV scenes, and shot the rest in 35mm with a 1.66:1 aspect ratio. All the 35mm material was fitted optically into 65mm negatives optically so we could do a complete 65mm negative assembly. For 35mm release, the 65mm negative was optically reduced to 35mm, retaining the two aspect ratios, which now became 2:35:1 and 1.66:1. Later, for video release, we filled the 3:4 video aspect ratio with the 35mm material, and squeezed the 65mm stuff into the same frame. To my knowledge there has not yet been a DVD or BluRay that retains the original aspect ratios and sound changes. Also, the film was mixed to change from mono sound on the 35mm material to full Dolby stereo on the wide shots, with purposeful exaggeration of surround fx. A recent e-mail discussion among large format experts from August 2008 resulted in a comment from Mr. Douglas Trumbull to Peter Anderson, ASC, about the true genesis of the film "Brainstorm". I have posted it here since it has general interest characteristics for everyone interested in 65mm photography. 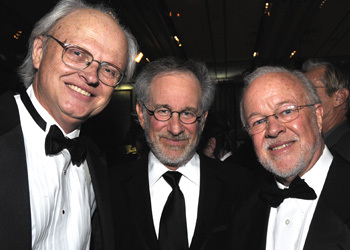 Dennis Muren, Steven Spielberg and Douglas Trumbull at the recent Visual Effects Society Awards in Los Angeles. Picture curtsey Bill Kallay.